Founded in 1979, ESPN has put Bristol on the Sports Entertainment map! Founded in 1979, Bristol is known for being the home of ESPN, the worldwide leader in sports, a leading multimedia sports Entertainment Company with over 50 business entities! In 2014, ESPN produced more than 47,000 hours of live event, and studio programming. 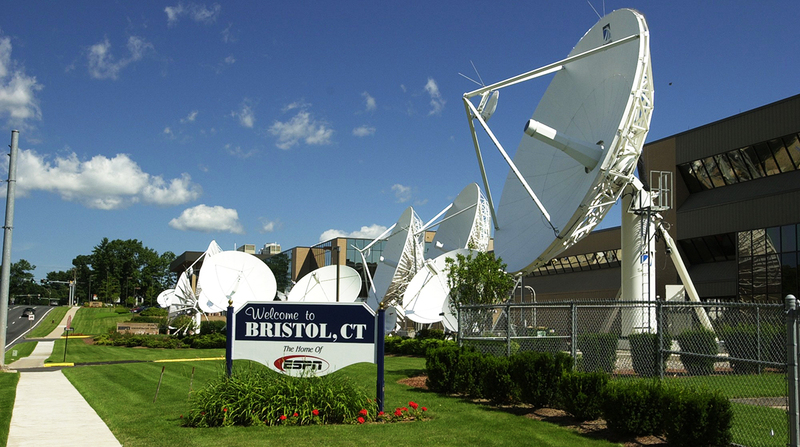 There are approximately 4,000 ESPN employees located in Bristol with about 8,000 worldwide. ESPN business is comprised up of 13 total websites, over 90 broadband networks, 7 radio properties, print, mobile, consumer projects, 32 television networks, and even event management.ESPN is 80 % owned by The Walt Disney company, through ABC. Inc, an indirect subsidiary. Although tours are not available, take a ride by the World Wide Leader’s impressive satellite field and campus that is nearly 1.2 million square feet in 17 buildings on 123 acres, to admire the scope of technology and media innovation occuring in the heart of our community!